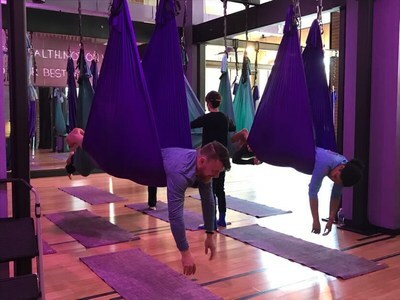 BOSTON, May 23, 2018 /PRNewswire-USNewswire/ -- Instructors taught warriors and their guests how to use yoga hammocks to support positions like planks, downward dog, and backbend stretches during a recent Wounded Warrior Project® (WWP) class. Anti-gravity yoga takes workouts to new heights by promoting physical and mental health. "I thought this might be an interesting and relaxing experience," said Army veteran Yerania del Orbe. "The inversion and the backflips out of the hammock reminded me of my more active days." After the light yoga workout, warriors and their guests cooled down, rejuvenated with a healthy smoothie, and got to know each other in a comfortable setting. Activities like yoga and socializing with other veterans can help injured warriors cope with stress and emotional concerns. In a WWP survey of the injured warriors it serves, more than half of survey respondents (51.6 percent) expressed they talk with fellow veterans to address their mental health issues, and 30.3 percent indicated physical activity helps. Yerania said she attends WWP events to help her and her family progress through her recovery process. "I'm always willing to try something new," she said. "We usually attend family events so we can stay active and include our baby, but this yoga class was something I did for myself." WWP program gatherings provide opportunities for injured veterans to form bonds with one another and their communities. WWP also serves warriors by focusing on mental and physical health and wellness, financial wellness, independence, government relations, and community relations and partnerships. "Wounded Warrior Project is my new veteran family that helps me heal, and it provides new tools and experiences for me and my family along the way," Yerania said. To learn and see more about how WWP's programs and services connect, serve, and empower wounded warriors, visit our multimedia page.